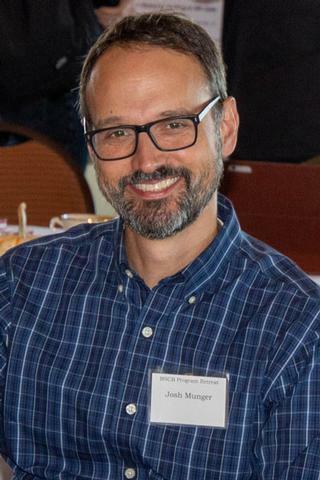 Joshua C. Munger, Ph.D., an assistant professor of Biochemistry and Biophysics, has received a prestigious Damon Runyon Cancer Research Foundation Innovation Award, which recognizes promising early-career scientists who have outstanding research but lack sufficient preliminary data to get traditional funding. The awardees are selected through a highly competitive process to receive $450,000. Munger is one of three recipients chosen for a strong vision to cure cancer. Munger’s research focuses on cancer cell metabolism. A virologist and biochemist by training, he is studying the metabolic activities that are altered when cells transform from normal to malignant. Whereas previous studies have focused narrowly on individual metabolic activities, Munger is taking a more global approach by examining the rates of numerous individual metabolic processes simultaneously. In doing so, he plans to elucidate novel metabolic activities specific to cancer cells, and define how they are activated by common cancer-causing genetic mutations. The ultimate goal of his research is to identify these novel cancer-cell-specific activities and to explore new avenues to block them and thereby destroy cancerous cells. Munger earned his Ph.D. at the University of Chicago in 2001, and stayed on at Chicago to train as a post-doctoral fellow for an additional year in the lab of Bernard Roizman, one of the world’s foremost experts on the herpes simplex virus and how it invades human cells. Before coming to Rochester, Munger worked as a post-doctoral fellow at Princeton University in the lab of Thomas Shenk, a leading expert in cytomegaloviruses. He joined the University of Rochester Medical Center in 2008. The other Damon Runyon recipients for 2010 are: Heather R. Christofk, Ph.D., of the University of California, Los Angeles, who is studying a cancer cell’s “sweet tooth,” to identify the proteins that alter the cells’ glucose metabolism; and Raffaelaa Sordella, Ph.D., of the Cold Spring Laboratory in New York, who is studying drug-resistant lung cancer cells at the molecular and genetic level, to ultimately develop therapeutic targets. For more information on the Damon Runyon foundation, please visit www.damonrunyon.org.